The Steinbeck group founded and now co-develops the Chemistry Development Kit (CDK), the leading open-source Java library for structural chemo- and bioinformatics. The CDK covers a wide range of functionality needed for performing virtual compound screening, property prediction and many other tasks of molecular informatics. In addition to its virtues for developing open systems in structural bioinformatics, it is a valuable tool for teaching. With 90.000 non commenting code statements (NCSS) in over 9000 methods in 900 classes, the CDK provides a basis for studying hands-on examples for the standard algorithms used in handling and modifying molecular structures as well as for calculating their properties, written in a modern object-oriented language, using commonly accepted design patterns. Willighagen, Egon L, Mayfield, John W, Alvarsson, Jonathan, Berg, Arvid, Carlsson, Lars, Jeliazkova, Nina, Kuhn, Stefan, Pluskal, Tomás, Rojas-Chertó, Miquel, Spjuth, Ola, Torrance, Gilleain, Evelo, Chris T, Guha, Rajarshi, Steinbeck, Christoph: The Chemistry Development Kit (CDK) v2.0: atom typing, depiction, molecular formulas, and substructure searching. In: Journal of cheminformatics, 9 (1), pp. 33, 2017. May, John W, Steinbeck, Christoph: Efficient ring perception for the Chemistry Development Kit.. In: Journal of cheminformatics, 6 (1), pp. 3, 2014. Steinbeck, Christoph, Hoppe, Christian, Kuhn, Stefan, Guha, Rajarshi, Willighagen, Egon L: Recent Developments of The Chemistry Development Kit (CDK) - An Open-Source Java Library for Chemo- and Bioinformatics. In: Current pharmaceutical design, 12 (17), pp. 2111–2120, 2006. Steinbeck, C, Han, Y Q, Kuhn, S, Horlacher, O, Luttmann, E, Willighagen, E: The Chemistry Development Kit (CDK): An open-source Java library for chemo- and bioinformatics. In: Journal of Chemical Information & Computer Sciences, 43 (2), pp. 493–500, 2003. Natural product-likeness of a molecule, i.e. similarity of this molecule to the structure space covered by natural products, is a useful criterion in screening compound libraries and in designing new lead compounds. A closed source implementation of a natural product-likeness score, that finds its application in virtual screening, library design and compound selection, has been previously reported by Peter Ertel. We then worked with him to product an open-source and open-data re-implementation of this scoring system and illustrated its efficiency in ranking small molecules for natural product likeness. The NP-Likeness scorer now lives at https://github.com/CS76/NP-Likeness. A workflow-based version of the Natural-Product-Likeness scoring system is implemented as Taverna 2.2 workflows, and is available under Creative Commons Attribution-Share Alike 3.0 Unported License athttp://www.myexperiment.org/packs/183.html. It is also available for download as executable standalone java package fromhttp://sourceforge.net/projects/np-likeness/under Academic Free License. 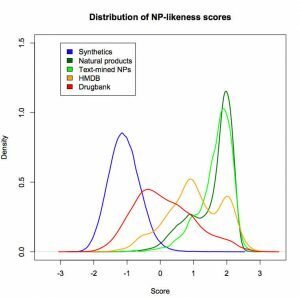 Jayaseelan, Kalai Vanii, Moreno, Pablo, Truszkowski, Andreas, Ertl, Peter, Steinbeck, Christoph: Natural product-likeness score revisited: an open-source, open-data implementation.. In: BMC Bioinformatics, 13 (1), pp. 106, 2012. Jayaseelan, Kalai Vanii, Steinbeck, Christoph: Building blocks for automated elucidation of metabolites: natural product-likeness for candidate ranking.. In: BMC Bioinformatics, 15 (1), pp. 234, 2014. In collaboration with Jarl Wikberg’s group and now Ola Spjuth’s group at the University of Upsala, Sweden, we co-founded the Bioclipse project to build a plug-in based, rich client desktop workbench for molecular informatics. Bioclipse won the JAX conference audience award for important European contribution to the development of Eclipse in 2006. On November 2007, the project was recognised with a jury prize in the 4th edition of the Trophées du Libre. Our group contributed plug-ins for spectrum handling, database editing and extension of Bioclipse’s Systems Biology capabilities. The spectrum facilities are grouped in the Speclipse feature. The integration of an Systems Biology Markup Language (SBML) editor and the integration of metabolomics simulations will be the next step. Bioclipse is a state-of-the-art, user-friendly, open-desktop application for performing System Biology Simulations. Spjuth, Ola, Alvarsson, Jonathan, Berg, Arvid, Eklund, Martin, Kuhn, Stefan, Masak, Carl, Torrance, Gilleain, Wagener, Johannes, Willighagen, Egon L, Steinbeck, Christoph, Wikberg, Jarl E S: Bioclipse 2: a scriptable integration platform for the life sciences.. In: BMC Bioinformatics, 10 (1), pp. 397, 2009. Spjuth, Ola, Helmus, Tobias, Willighagen, Egon L, Kuhn, Stefan, Eklund, Martin, Wagener, Johannes, Murray-Rust, Peter, Steinbeck, Christoph, Wikberg, Jarl E S: Bioclipse: an open source workbench for chemo- and bioinformatics.. In: BMC Bioinformatics, 8 (1), pp. 59, 2007. The JCAMP-DX project is the reference implemention of the IUPAC JCAMP-DX spectroscopy data standard. It implements a parser and a writer to convert JCAMP-DX files to Java objects. A number of application which we developed in the past are now outdated for various reasons or are simply not developed by us anymore. They are listed here for documentation purposes. Nmrshiftdb was a web-based database for organic structures and their nuclear magnetic resonance (nmr) spectra. It was originally developed in our group by Stefan Kuhn and funded by the German Research Council (DFG). Stefan Kuhn now thankfully continues to develop the database under the name NMRShiftDB2, which is now hosted by our colleague Niels Schloerer at the Univeristy of Cologne. NMRShiftDB2 allows for spectrum prediction (13C, 1H and other nuclei) as well as for searching spectra, structures and other properties. Last not least, it features peer-reviewed submission of datasets by its users. The nmrshiftdb2 software is open source, the data is published under an open content license. JChemPaint (JCP) is an editor and viewer for 2D chemical structures developed using CDK. It is implemented in several forms: a Java application and two varieties of Java applet. It can also be used as a component to embed in other applications. JCP has well tested an user-friendly interface. Its behaviour is consistent in the application and the applet. The amount of novel basic research to be performed while developing the CDK goes significantly beyond what is to be expected from what looks like a pure infrastructure project. Questions of how to perceive aromaticity, perform fingerprinting of structures or define pharmacophore queries, are often researched and published in CDK context for the first time. Krause, Stefan, Willighagen, Egon, Steinbeck, Christoph: JChemPaint - Using the Collaborative Forces of the Internet to Develop a Free Editor for 2D Chemical Structures. In: Molecules, 5 (1), pp. 93–98, 2000. 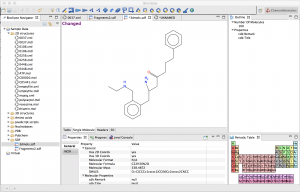 OrChem is an Oracle database chemistry plug-in using the CDK. For chemistry databases, various commercial “cartridges” exist that facilitate searching and analyzing chemical data. OrChem also provides functionality like this, but is not a cartridge. It doesn’t need Oracle’s extensibility architecture because its Java components run as Java stored procedures inside the Oracle standard JVM (Aurora). Rijnbeek, Mark, Steinbeck, Christoph: OrChem - An open source chemistry search engine for Oracle(R).. In: Journal of cheminformatics, 1 (1), pp. 17, 2009.